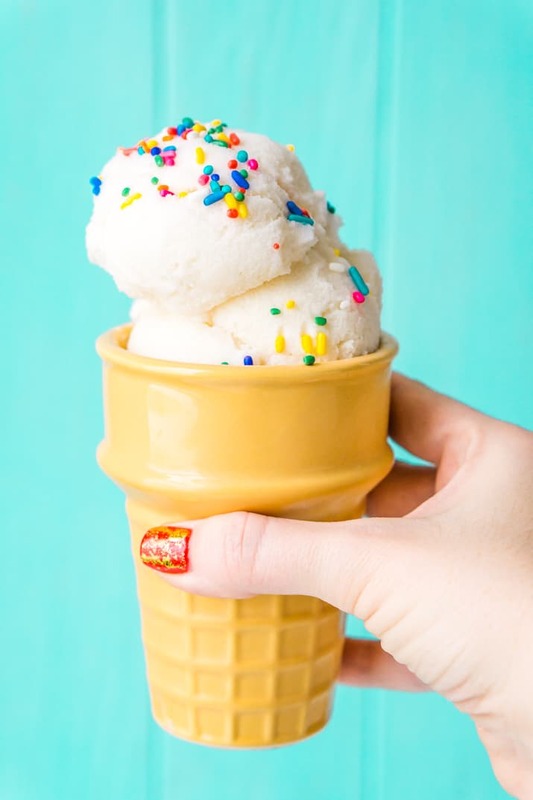 This Snow Cream is an easy homemade ice cream made out of actual snow! A fun recipe to make with the kiddos in vanilla, caramel, or chocolate flavor! Have you ever made Snow Cream? Freshly fallen white snow may resemble sweets like cotton candy, vanilla frosting, and marshmallow fluff, but sadly, it doesn’t taste as good as these sugary treats. 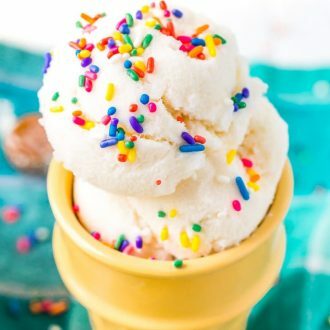 But with this Snow Ice Cream recipe, it can! In your childhood memories, you may recall biting into a snowball to get nothing but a mouthful of bland, frozen water. But with this easy three-ingredient recipe for Snow Cream, those cold white flakes get a mouthwatering makeover when they’re used to make a yummy dessert! Remember the magic of snow days? That feeling of waking up on a school morning with fat snowflakes falling from the sky, then turning on the television in hopeful anticipation and learning that school is canceled? Instead of sitting in a boring classroom all day, you had the whole day off to do whatever you pleased! It was like Christmas morning all over again. Especially if your parents still had to go to work 😉 Free At Last! You can recapture a little bit of nostalgia with this homemade Snow Cream recipe, which can be made and enjoyed by the whole family! 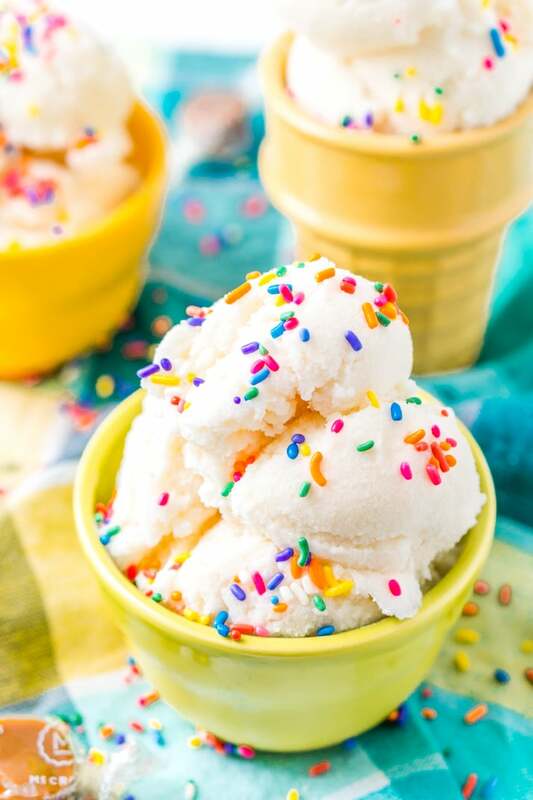 Concocted with only a couple components, you may already have the ingredients for Snow Ice Cream in your kitchen — and in your yard! 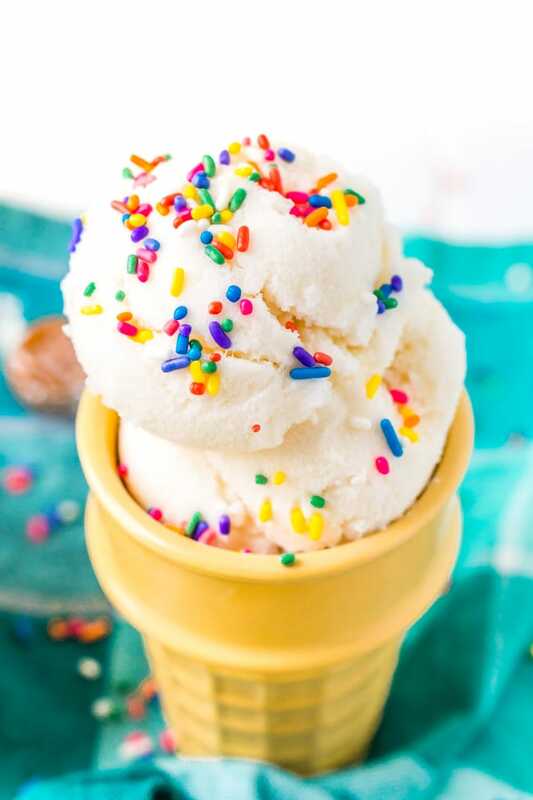 Part snow cone, part ice cream, this tasty treat is a blast to make, especially with the kiddos. Have them head outside to collect a few handfuls of (clean! ), fresh snow to get the recipe started. First, add about 8 cups of snow to a large mixing bowl, set the rest of the snow aside in another large bowl. Next, add half of the sweetened condensed milk and the vanilla to the snow and stir to combine with a rubber spatula. You can also use a hand mixer on low speed. Then, add 4 more cups of snow and sweetened condensed milk to the bowl, as well as any syrup if you’re adding it. Mix to combine. The sweetened condensed syrup will help to thicken the snow and make it extra creamy. Add more snow if needed. Finally, feel free to fold in any extras, then scoop into ice cream bowls or cones and top with sprinkles. 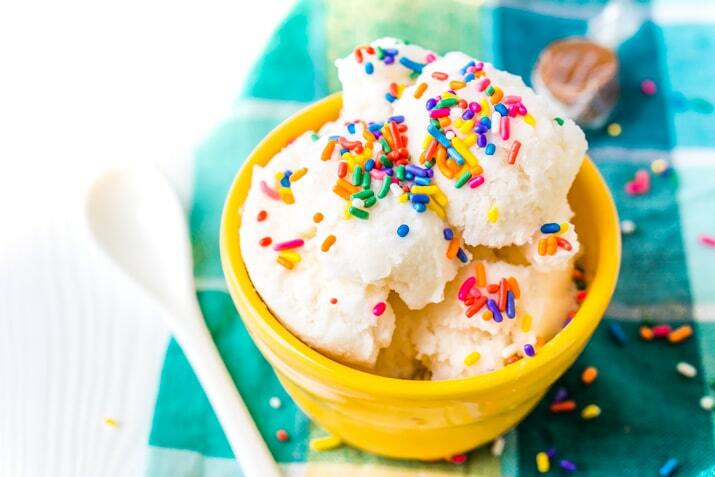 Like any frozen dessert, Snow Cream is made extra-fun with a variety of tasty toppings. Play around with sauce, nuts, whipped cream, and of course, rainbow sprinkles are a must! Set up a bar with all the munchies and mix-ins you can dig out of your pantry, and let everyone customize their own snow ice cream sundaes. There’s no better way to enjoy a snow day or school vacation! 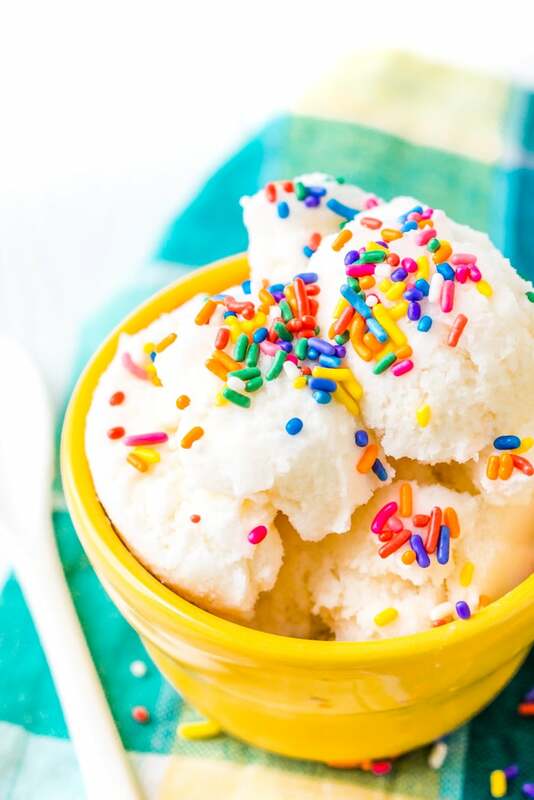 You’ll have a hard time deciding what you love most about Snow Cream: the ridiculously simple recipe, the scrumptious flavor, the 5-minute prep time, or the fact that it’ll keep kids busy from start to finish! It’s also a great activity to try when you’re hosting a winter sleepover or get-together with your kids’ friends. It’s also great for winter break and pulling the kids away from their screens for an hour! Snow Cream is a fun, festive treat to make good use of the winter snow. Not only is it a blast to make and enjoy with the whole family, but it’ll bring you a dose of nostalgia for the snow days of your childhood. Follow it up with a delicious White Hot Chocolate to warm you back up! Make sure to use fresh snow, the best way to do this is to plan ahead and put out a couple of large bowls once it starts snowing to catch the snow in. The amount of snow you’ll need will vary on the type of snow, so gather a lot and use what you need to get the consistency you want! You will need more snow if you add a flavored syrup like chocolate or caramel. You can flavor snow ice cream a lot of different ways. I recommend adding a 1/4 cup of syrup such as chocolate, caramel, or butterscotch. But you can also use extracts like vanilla, almond, and coffee. Feel free to mix in other fun ingredients like fresh fruit, candy, and nuts. Add about 8 cups of snow to a large mixing bowl, set the rest of the snow aside in another large bowl. Add half of the sweetened condensed milk and the vanilla to the snow and stir to combine with a rubber spatula. You can also use a hand mixer on low speed. Add 4 more cups of snow and sweetened condensed milk to the bowl, as well as any syrup if you're adding it. Mix to combine. The sweetened condensed syrup will help to thicken the snow and make it extra creamy. Add more snow if needed. For the syrup, you can use any sundae syrup you'd like such as caramel, chocolate, butterscotch, strawberry, and more. 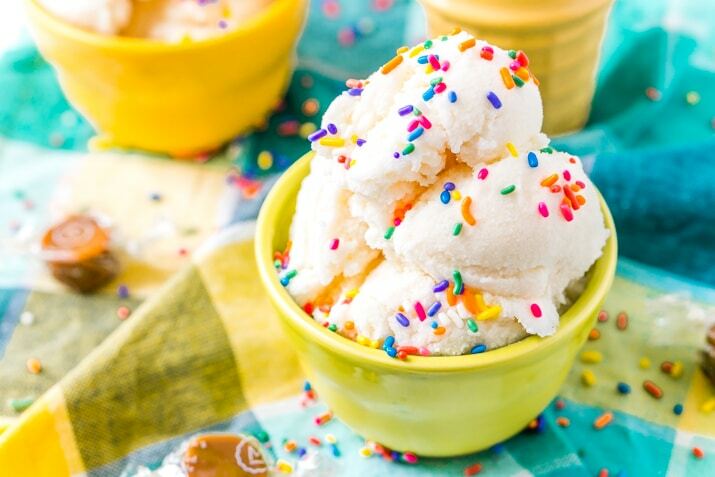 For vanilla ice cream, simply leave out the syrup and double the vanilla extract for a more intense flavor. There are a lot of different kinds of snow and some may be heavier or fluffier than others. The type of snow may impact the amount you need for the recipe. Pin this Snow Cream Recipe for Later! I am so jealous of this post! Being a native Floridian, the only time I’ve ever seen that much fresh snow was at a ski resort on North Carolina! I live way too far south to enjoy this down here, but one of these days…I’m making it! It looks so tasty! I’ve heard about snow cream 3 times in the last week! We just had two storms in NC but the snow is all melted now … here’s to hoping for another one? I hope if you get another storm this winter you get a chance to make this! This snow cream is so pretty! I’ve never made it myself but I have pictures of my mom and my grandfather making it that I treasure. So fun, I guess it’s time to bring the tradition back to life! There’s no snow (ever!) here in LA, CA — BUT, I’m definitely sending this to my friends who have snow. This is such a fun recipe. I’ve never heard of making this with real snow. So cool! 🙂 And the sprinkles make it so festive. Thanks, it’s definitely a fun an seasonal recipe! Oh I am so jealous. I have never seen that much snow. The only snow I’ve ever seen is a few inches. This looks so good. My kids would love this..
Might be time to book a snowy escape! I love snow cream! Now that we are FINALLY having snow We can make this! I have never heard of snow ice cream! What fun for the kiddies! Such lovely photos here too! Great job! Thank you so much, hope you guys get a chance to try it soon! Oh my goodness, what a fun activity and treat for kiddos! Hard to say which would be more enjoyable, collecting the snow, making the cream, or eating it! we only get the odd dusting – but snow cream sounds wonderful! Oh it is, I hope you get to experience deep snow at least once!